Old Crossleyans produced a rousing performance to beat visitors Wath Upon Dearne 31-21 and move out of the Yorkshire Two relegation places yesterday. They have a single point advantage over Leodiensian, who lost 12-6 at home to Wetherby, as the league enters the final four rounds of fixtures. There will, inevitably, be further twists in the battle to avoid the drop but there was plenty for the home support to be optimistic about. The first half performance was, arguably, Crocs’ best of the season as they built a commanding 23-0 lead. Wath came back strongly but the points cushion proved sufficient to calm any nerves the home fans may have been experiencing. 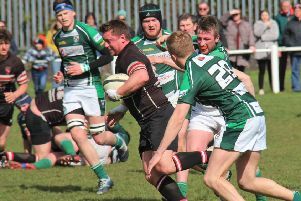 Ryan Sweeney gave Crocs an early lead when he landed a penalty following a high tackle. Excellent work from Troy Frisch resulted in Wath being penalised for not releasing. The penalty was missed but this was a blip in what was otherwise an outstanding kicking display from Sweeney. Sweeney was involved again when Boj Sembi and Richard Wheale combined to release him on the right wing. He kicked ahead, deep into Wath territory, forcing the scrambling defence to concede a five metre scrum. Patient recycling eventually allowed Frisch to crash over the line on the quarter hour. Sweeney’s conversion stretched the lead to 10-0. Wath failed with a penalty midway through the half and Crocs spilled the ball, having intercepted in midfield. It didn’t prove costly and a few minutes later Devin Wills produced a moment of brilliance as he weaved his way through the Wath cover to score in the corner. Sweeney converted and Crocs led 17-0 after 28 minutes. A further penalty extended the advantage to 20-0. Wath kicked to the corner from a penalty but stirling defence forced turnover ball and when the visitors threatened again shortly after they were penalised for not releasing. Wells thumped a long raking clearance down the right flank and the final action of the first half saw Ryan Sweeney land a fine penalty from the touchline. Wath came back strongly and scored their first points after 45 minutes. A quick tap penalty on half way caught Crocs not concentrating and Adam West charged under the posts. Whitlam’s conversion reduced the arrears to 23-7. Buoyed by this success Wath again applied pressure and asked questions of the Crocs’ defence. A clearance kick was charged down but centre Joe Wilkinson tidied up on his own line and then surged into the opposition half, leaving defenders in his wake. Wilkinson was part of a flowing back line move shortly after which enabled Sweeney to cross over in the corner. It was a much more even second half and Wath responded with a try on 60 minutes. AJosh Bird crashed over from a ruck and Whitlam converted to make it 28-14. Wath continued to press and knocked on to spurn a scoring opportunity. The game became fractious and both sides lost a player to the sin bin for separate incidents. Sweeney eased any lingering concerns when he slotted a penalty from just inside the Wath half on 71 minutes to make it 31-14. The visitors comprehensively pushed the Crocs’ pack off the ball from their own scrum feed and West picked up to score his second try of the afternoon in the corner. Whitlam converted from the touchline to complete the scoring.